We’ve rounded up 5 independent, university, and community-based productions that you can catch this February. 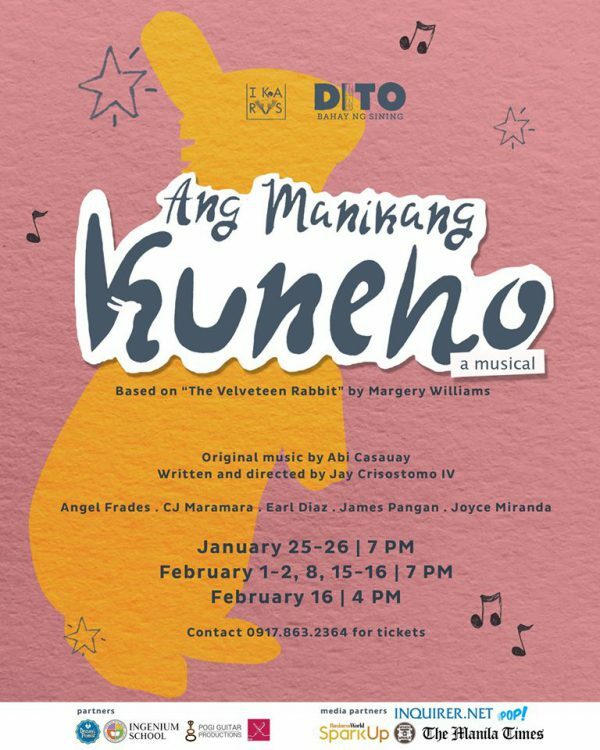 Ikarus Theater Collaborative opens its 6th season with ‘Manikang Kuneho’, a Filipino musical adaptation of Margery Williams’ ‘The Velveteen Rabbit’. The show will be directed by Jay Crisostomo IV, who also adapted the children’s story for the stage. The music is composed by Abi Casauay. Cast members include Mary Joyce Miranda (Kuneho), CJ Maramara (Bata), Earl John Diaz (Timothy, Bapor, Do, Doktor), James Vic Allen Pangan (Kabayo, So, Doktor), and Angelique Frades (Yaya, Diwata). 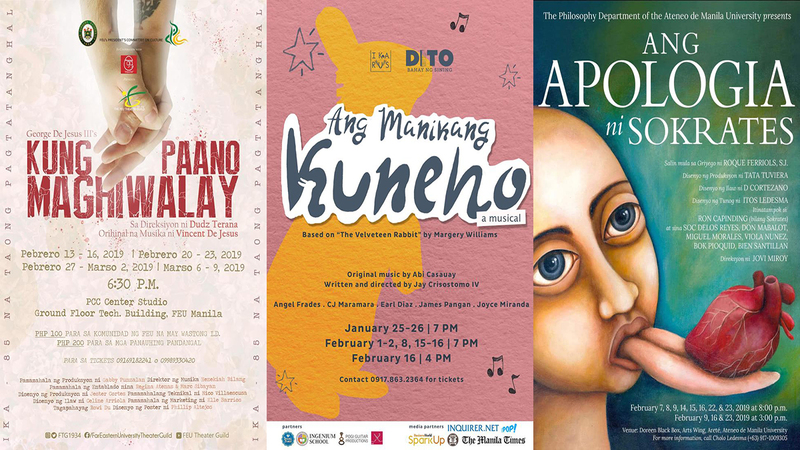 The production will run from Feb 1-2, 8, 15-16 at DITO: Bahay ng Sining, J. Molina St, Concepcion Uno, Marikina. For ticket inquiries and reservations, contact 0917-8632364 or e-mail ikarustheater@gmail.com. 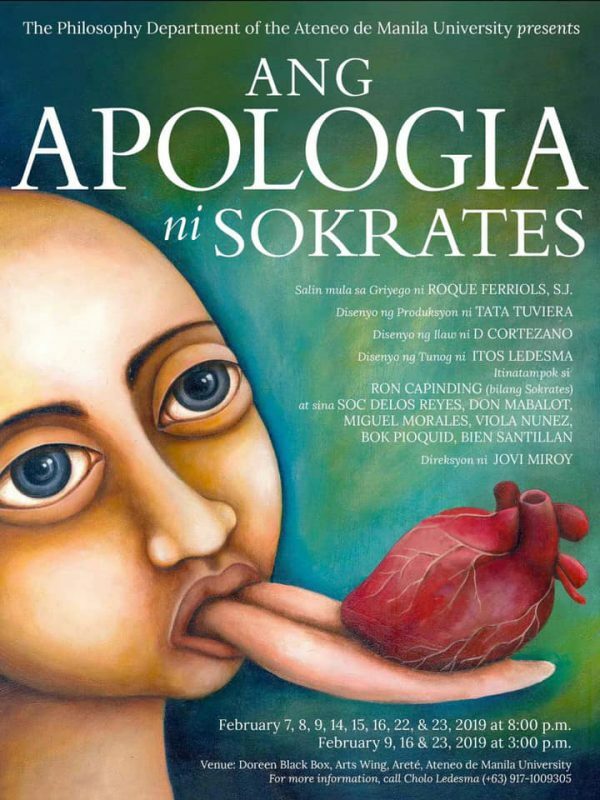 The Ateneo Philosphy Department’s ‘Ang Apologia ni Sokrates’ brings to stage the classic text in European Philosophy, written by Plato and translated from the original Greek by Roque J. Ferriols, SJ. Accused of corrupting the youth, Socrates delivers an “apologia” or defense against false accusations. The 70-year old philosopher knew the tragic fate of those who questioned authority. Envisaged as Interactive Theater, the production will give the illusion that the audience are being taught by Socrates himself. Philosophy teacher Jovi Miroy directs the play, while Ron Capinding essays the role of Socrates. The cast includes actors from the other units of the ADMU Community– Soc de los Reyes, Don Mabalot, Miguel Morales, Viola Nunez, Bok Pioquid, and Bien Santillan. Apart from Miroy, other members of the artistic team include Tata Tuviera (costume design), Itos Ledesma (sound direction), and D Cortezano (lighting design). ‘Ang Apologia ni Sokrates’ will run at the Doreen Black Box, Arts Hub, Arête on February 7, 8, 9, 14, 15, 16, 22, & 23, 2019 at 8:00PM and February 9, 16, 23, 2019 at 3:00PM. Tickets are priced at P400.Contact Cholo Ledesma (09171009305) for details. 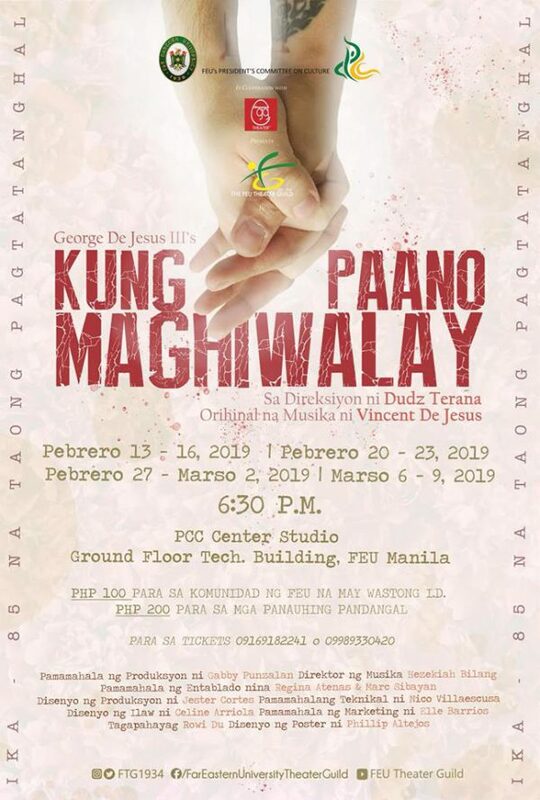 In time for this Valentine’s season, the FEU Theater Guild is staging George De Jesus III’s ‘Kung Paano Maghiwalay’, under the direction of the company’s Artistic Director, Dudz Teraña. The play will tell multiple stories about love and separation. The show will run from February 13-16, 20-13, 27, March 2, 6-9, 6:30pm at the PCC Center Studio of the Ground Floor of the FEU Technology Building, FEU Manila. Tickets are priced at P200, and P100 for FEU students. For ticket inquiries, contact 09970765168. 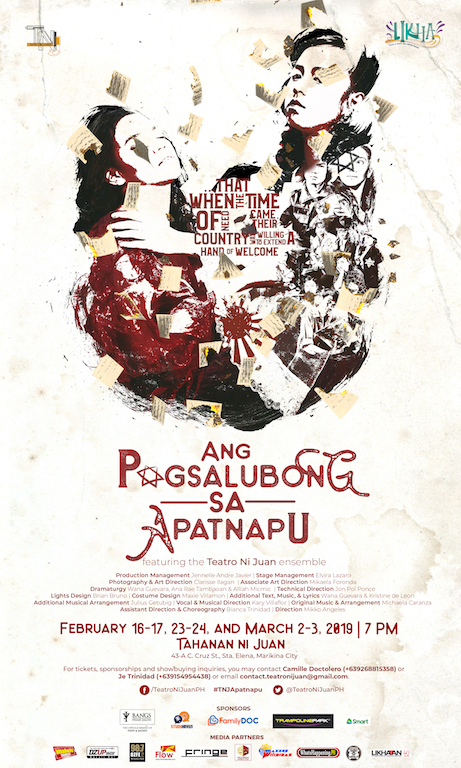 Teatro ni Juan, Marikina’s premiere community theater, closes its 11th season with ‘Ang Pagsalubong sa Apatnapu’, a new musical that re-envisions the real-life events that happened in the early ’40s. A deranged writer recounts how the Jewish refugees found their way to the Valley, escaping the terrors of Kristallnacht. President Manuel Quezon welcomes the ‘Manilaners’ to his abode in the small city of Marikina. Together with the Marikeños, they establish an intercultural nexus with a deeper bond as a community; a forewarning for the turmoil yet to come — the requisitioning of the Japanese Imperial Army over the islands. Featuring the Teatro ni Juan ensemble, the musical is a tread through the remarkable contribution of Marikina to the Philippines’ historical narrative — one that has long been unnoticed by the history books and one that is worth telling the generations to come. The show will be directed by Mikko Angeles. 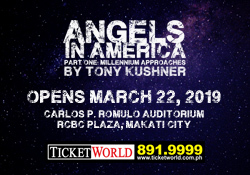 Other members of the artistic team include Jonpol Ponce (Technical Direction), Brian Bruno (Lights Design), Madeline Villamon (Costume Design), Wana Guevara & Kristine De Leon (Additional Text, Music and Lyrics), Julius Getubig (Additional Musical Arrangement), Kary Villaflor (Vocal and Musical Direction), Michaela Caranza (Original Music and Arrangement), Bianca Trinidad (Assistant Direction & Choreography), and Wana Guevara, Ana Rae Tambaoan and Alliah Micmic (Dramaturgy). The production will run on February 16-17, 23-24 and March 2-3 (Saturdays & Sundays, 7pm) at Tahanan ni Juan, 43-A C. Cruz St., Sta. Elena, Marikina City. Tickets are available at P150 with limited seating. For tickets, sponsorships and showbuying inquiries, contact Je Vincent Trinidad (+639154954438) or Camille Doctolero (+639268815358 ) or email contact.teatronijuan@gmail.com. *** Tahanan ni Juan is a found space venue with no air-condition. 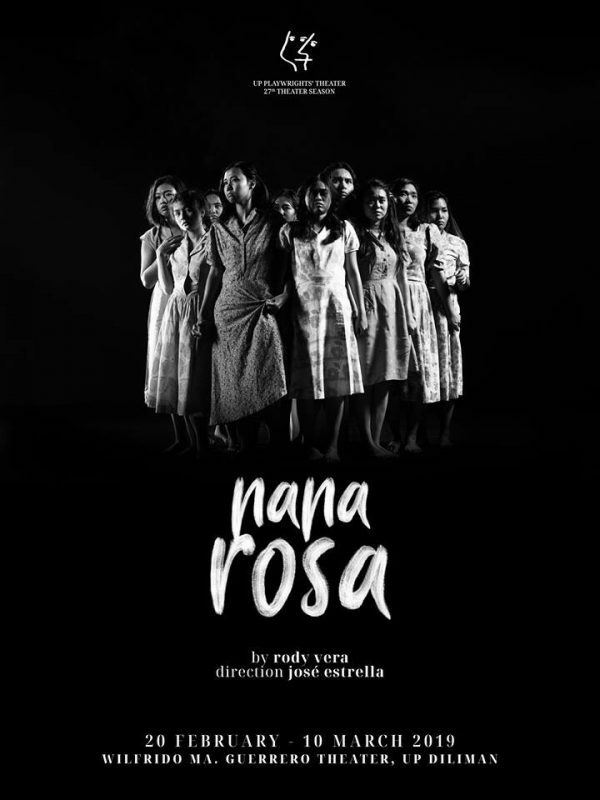 ‘Nana Rosa’ tells the story of Maria Rosa Luna Henson, the first Filipino Comfort Woman to make her story public. The show recounts her life starting from WWII, where she became a comfort woman, up to 50 years later, when she decided to come out with her story. The play touches on the trafficking of women, the brutality of war, and the repeated attempts of denial and erasure of Comfort Women in history. Directed by José Estrella and written by Rody Vera, the play will run from February 20 until March 10, 2019 at the Wilfrido Ma. Guerrero Theater, 2nd floor, Palma Hall, UP Diliman, Quezon City. Tickets are priced at P500, with discounts for bulk purchases and senior citizens. For inquiries, contact UP Playwrights’ Theatre at 926-1349/981-5000 local 2449 or Nico Varona at 0917-5198879/ upptnanarosa.marketing@gmail.com. Previous WATCH: “Dirty Old Musical” Cast Sings 70-80’s Hits ‘Pag Tumatagal Lalong Tumitibay,’ ‘Legs’ and More!